"Action, open eyes, strange minds and isolation occur while living in a city in the world nowadays – it is unavoidable. People even make jewellery about it." 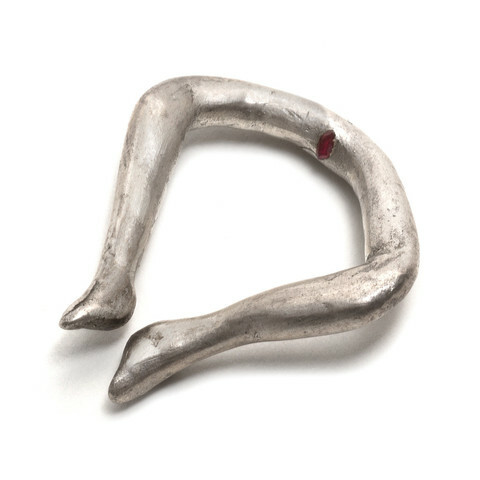 Jewellery Artist and Sculpture Teresa Lane evokes curiosity by creating an unconventional narrative form of jewellery using an abstract and figurative visual language. The ring depicts a body-less legs that opens up and gently curves around, to form an inviting yet uninviting metaphor depending on how you view it. The marquise shaped blood-red ruby is deliberately placed on the inside of the ring in a position that makes sense to us. The symbolism of this ring is uniquely fascinating by loosely implying the pronounced objectification of women in modern society and there are two ways to respond to this; to conceal women's sexuality and nurtured submission by wearing the ring, ultimately bowing to extreme societal pressure and traditional ideas, or alternatively, by openly confront and liberate women by breaking free, therefore the ring is left unworn and on open display to reveal all its glory, power and strength. However, a ring is ultimately adorned at all times or stored away in jewellery boxes - a symbolism of defeat perhaps.